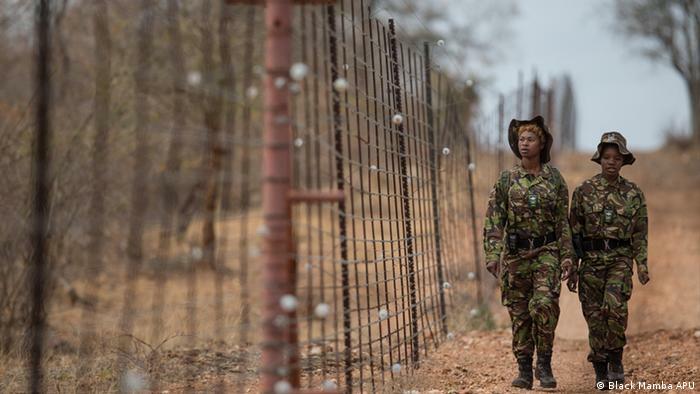 Would-be rhino killers in South Africa have a new force to contend with: the continent’s first all-female anti-poaching unit. Felicia Mogakane is a member of the Black Mambas, Africa’s first all-female anti-poaching unit. They patrol unarmed within the private 50,000 hectare Balule nature reserve situated within the Greater Kruger National Park in South Africa. The project was set up three and a half years ago and all the team members are young women from the local area. The Black Mambas are the brainchild of Craig Spencer, the head warden and a Director of Transfrontier Africa the Organisation, who wanted to do something to tackle the disparity between the wealthy reserve and the largely poorer communities that live on its borders. South Africa’s poaching crisis was so bad that at one stage it was estimated that a rhino was being killed in the country every seven hours. Since the Black Mambas were set up, the number of rhinos poached has dropped dramatically in the reserve, while elsewhere the animals continue to be killed daily for their horns. In the group’s first 13 months no rhino was poached and a total of 12 were poached in the past 30 months. Mogakane spoke to DW about her work with the group. “Patrolling the fence is an important part of our job. We have to check it is 100 percent electrified and there are no holes. If there are any holes we fill them with rocks, and if we see it has been cut anywhere, we then fix it. When we go into the bush we are looking for snares and wires that poachers use. They can catch an impala, even a rhino can be caught in a snare. So when we are patrolling, we sometimes fear for poachers because they are there looking for rhinos and other animals – the big five. We are not scared of the animals because we are trained in how to deal with and confront them. Our volunteers monitor the rhinos each and every day to see if they are alive. We have trackers on them. If we encounter poachers, then we call for an armed response to come and help us. Each and every time we listen out for suspicious things and noises such as gunshots. In this reserve we have not encountered poachers directly, but in some of the other reserves the Black Mambas have found them. We are now 36 members. I live near Kruger National Park. My village is near. When I was growing up my parents worked there – my father was a ranger. So sometimes we would go there and do game driving and look around. Through that I developed a love for nature conservation. Then I went to bush school where they teach about conservation and why it is important not to kill animals. Then I applied for the Black Mambas and got the job. Ever since the Black Mamba project started, there has been no rhino-poaching in our reserve. In other reserves they are still being poached every day. The number of snares has been reduced by 76 percent, so I think the project has been very helpful.